YOUR ENGINE NEEDS TO BREATHE CLEAN AIR. Did you know your car breathes about as much air in 1 day as you do in 1 year? A clean engine air filter is critical to maintain engine performance. Right now receive 10% off air filters! Keeping the air you breathe clean is important too. 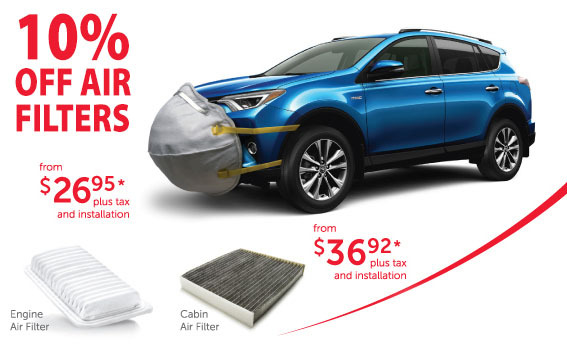 Your cabin air filter helps reduce pollen, dust, and odours inside your Toyota vehicle. By changing your engine air filter and cabin air filter every 12 months or 16,000 kms, you and your Toyota vehicle will breathe easier. Some restrictions apply, see 1000 Islands Toyota for details.